Growing a garden is a fairly easy way to provide food for your family or even to make a profit. But growing a garden starts long before the time when you actually plant the seeds. Quite a bit of planning goes into getting ready and creating the perfect environment in which to grow your vegetables. When making a vegetable garden plan, there are a few factors that you’ll want to consider prior to planting. These include factor such as how much space you have, which crops you want to plant, and where each plant will grow best. Factors for Making a Vegetable Garden Plan. How Much Space for your Vegetable Garden? Some people have excessive amounts of space in their gardens and don’t really need to be concerned about efficient use of space. However, many people want to grow gardens in their backyards or other places that only have limited amounts of space. In this case, planning becomes critical in how you plant your garden. The traditional system of planting in rows is effective, but not extremely efficient. If you have less space, try planning a square foot garden. This allows each crop to have its own allotted area of one square foot of space (or you can allot two or more to a vegetable you like) and there is no wasted space in between each vegetable. This works very well for raised bed gardens which are limited to the width of only how far you can reach across to the middle. Which Vegetables Will You Grow? Determining which vegetables to grow has to do with what you plan to do with your vegetables. If you are simply growing food for your family, you will want to grow based upon the preferences of what your family likes to eat. If you are growing to make a profit, then you’ll want to grow crops that are quick, easy-to-grow, and are able to bring a hefty return financially at a farmers’ market or with friends and neighbors. For fast turn-around times, try vegetables such as carrots, lettuce, radishes, garlic, or basil. Most families like these for salads and they also sell well. Where to Plant Your Vegetables? Making your vegetable garden plan will have to do with the placement of vegetables related to the sun and the size of the plants. When planting in rows, try to make the rows direct from north to south. Place the taller, larger plants in the back, toward the north. Then put the medium plants in the middle and smaller plants in the front. This allows for an excellent appropriation of sunlight as well as access for you in order to weed them. Once you’ve created your vegetable garden plan, and the last frost has passed, it’s time to get planting! An easy way to get everything you need to grow a vegetable garden for profit comes through growing systems such as Seed to Cash, where the seeds and growing guides are provided for you. 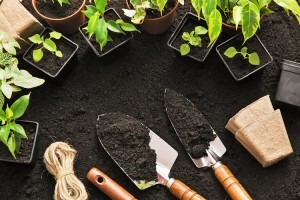 All you need is soil, some simple gardening tools, and a place to sell your crops—then you can make up to $200 profit in as little as two weeks!